...We can spot a nose plug and earrings, and that’s not counting his big headdress, long quetzal feathers and precious jaguar skin mantle! 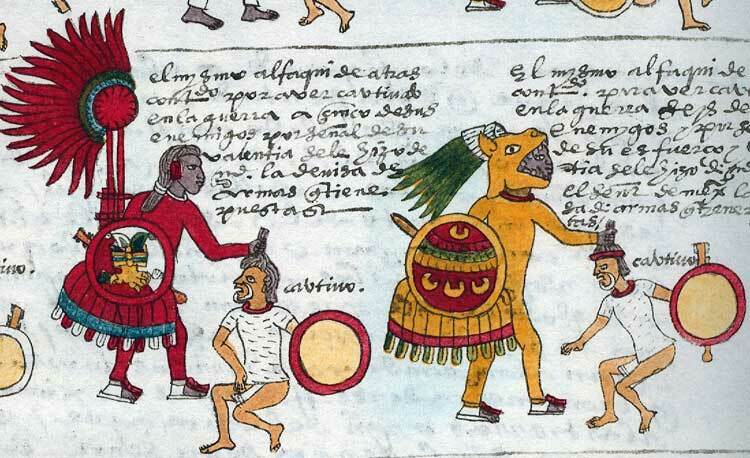 Not every Aztec could dress up as splendidly as Quetzalcoatl. There were strict rules about who could wear what – and you didn’t want to get caught by the fashion police because punishment could be harsh. Why was certain jewellery “off limits” to normal people? 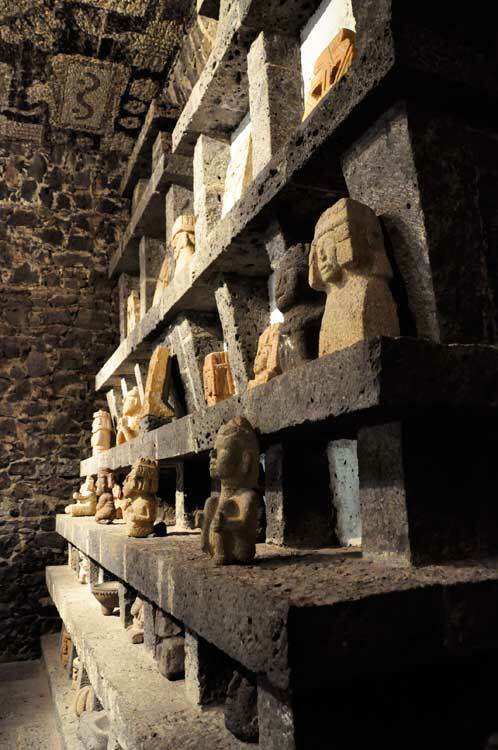 The Aztecs lived in a hierarchical society (pic 2), which means that they marked the difference between people’s social class, as well as their trade, office, and their origin. Which class you belonged to was obvious from a person’s lifestyle and their use of ornaments, clothes, sandals and headdresses. Rules governing what people owned and wore were enforced in law, and are called sumptuary laws. 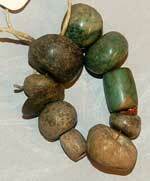 As a commoner (pic 1), you might own some luxury items, like jade beads, for example, but you could not wear them. However a noble could! According to ancient sources, only the Aztec ruler and great lords could wear lip plugs, ear plugs and nose ornaments of gold and valued stones such as turquoise and jade. No one could wear feather articles without the permission of the ruler, and only the ruler and his prime minister could wear sandals (pic 3) inside the royal palace! Lip plugs (pic 4) were awarded to men and women when they were young. For boys, this would be a reward for taking a captive in war; for a girll, on marrying. Depending on your achievements in life, lip plugs could become very elaborate. These lip plugs (pic 5) are made of obsidian, a type of glassy volcanic rock. 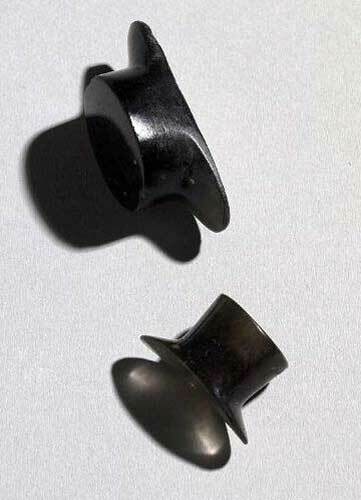 The most finely carved obsidian lip plugs would be worn by nobles. The rock is almost transparent! People from different cultures might be identified by their lip plug. 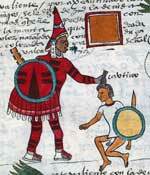 Here (pic 6) are two captives caught by the Aztecs and held by their hair. 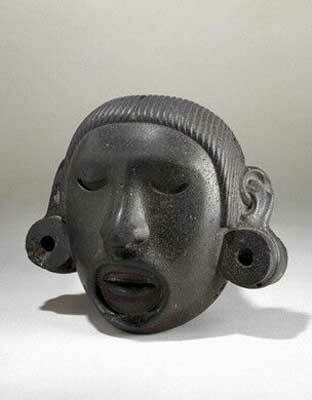 They are from the region of Huexotzinco and are identifiable because they both wear a curved lip plug. Here (pic 7) are lip plugs that were made for Aztec nobles. They are described as “long yellow labrets [lip plugs] set in gold or clear crystal with a blue feather running through it, also set in gold”. This would be inserted into the lower lip, with the short edges resting along the inside of the lip. Q. “What is it that is a horizontal drum of green stone bound about the middle with flesh?” A. 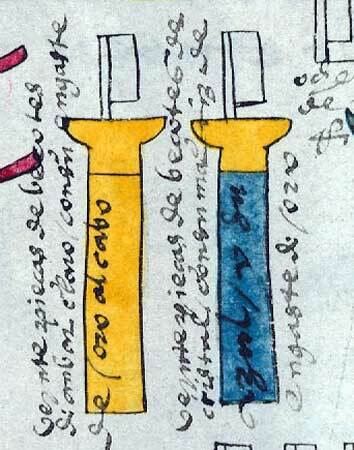 “One can see from our little riddle that it is the ear plug.” (Florentine Codex). Not all ear plugs were “round drums” like the ones shown in pictures 8 and 9. They could be all sorts of shapes and materials like wood, bone, shell, leather, obsidian, polished stone, reed, and more precious metal and stones such as gold, amber, turquoise and jade. 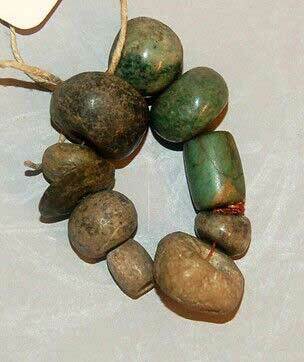 The one used by the midwife (pic 9, right) is precious jade, linked to fertility, water and femininity. The mother’s white ear plug (pic 9, left) might have been made from bone or polished stone. 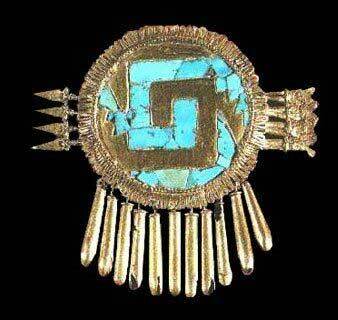 Aztec jewellery could symbolise important themes, even gods. For example, cotton was a symbol of being feminine because women used it to spin and weave. 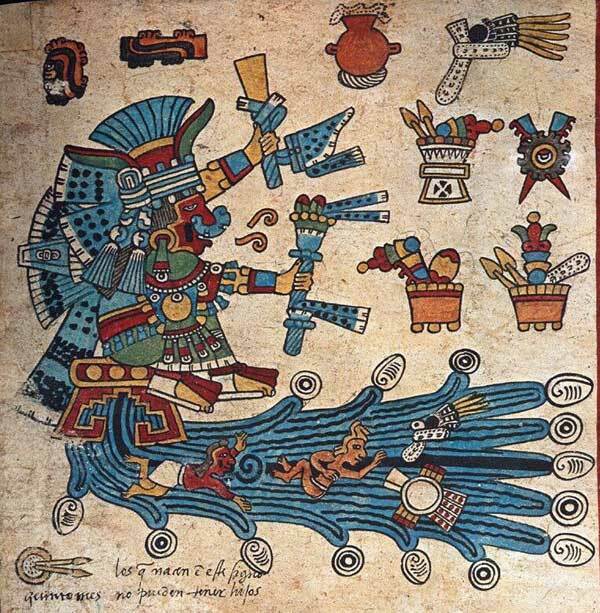 The Cuexcatl warrior in picture 10 has unspun cotton ornaments hanging from his ears. He belongs to the order of Huaxtec warriors, a proud and skilled tribe that came from north east Mexico. Their protector was the great mother goddess, so they wore cotton in her honour. Like the lip and ear plugs described above, nose ornaments were made of a wide variety of materials. Some nose plugs could be a traditional round shape, but in picture 11 we’ve included some of the more ornamental types that would have been worn by lords, great warriors and priests. 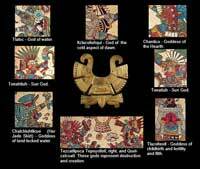 The gold ornament in pictures 11 & 12 must have been worn by someone special because the close-ups of Aztec gods surrounding the main image show that they, too, wore similar jewellery. 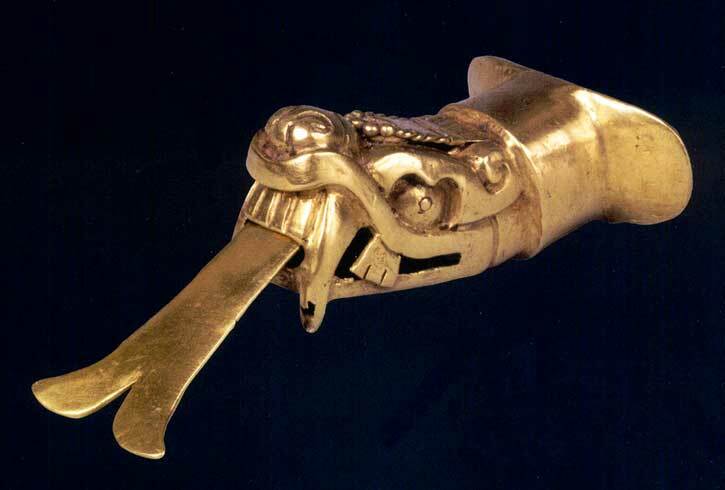 This gold ornament may have been worn by an ixiptla, a priest whose special role it was to impersonate a god. Look at the surrounding pictures again; which god do you think would have represented this ornament? “We shall love him like a precious necklace, a precious stone bracelet” (Florentine Codex). In the Aztec world necklaces of precious stones are often mentioned to refer to anything of great value. The quote above talks of a parent’s love for their child as they welcome it into the world. Precious stones also serve as symbols. 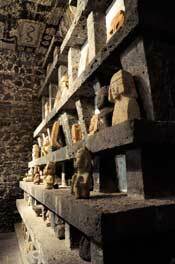 In picture 14 you can see the water goddess, Chalchiuhtlicue, whose name means “Jade-Her-Skirt”. The drops sprouting from the river running beneath her are symbolic of jade stones. So, jade is a symbol of water. Jade stones such as these were shown green or blue. 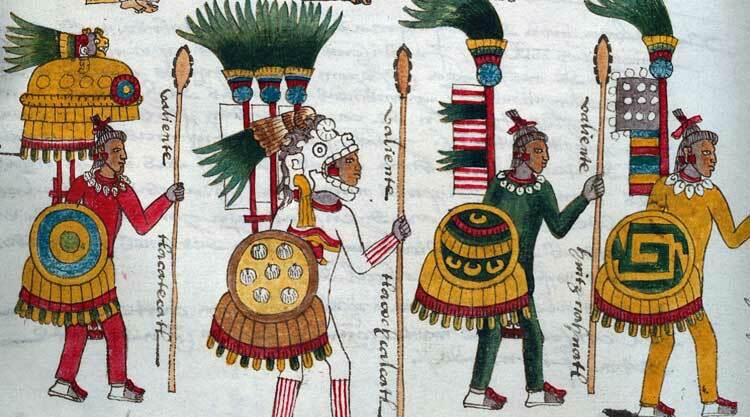 Turquoise, called xihuitl in the Aztec language Nahuatl, was often given the same colour as jade in ancient manuscripts. 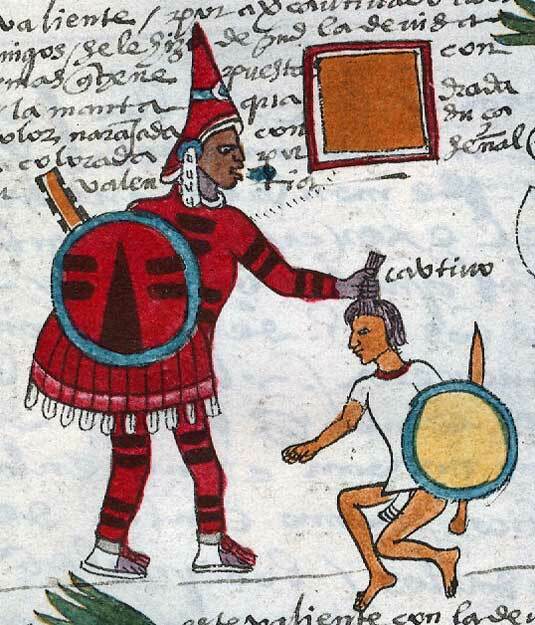 In fact, the word xihuitl means both ‘year’ and ‘turquoise’ and they were often shown together. Pic 15 is part of a calendar with turquoise-coloured year signs. They count from the year 5 Rabbit to the year 1 Reed. • Shell Necklace (right-most warrior). Warriors and participants in religious festivals would wear ankle and wrist bracelets that also served as musical instruments. 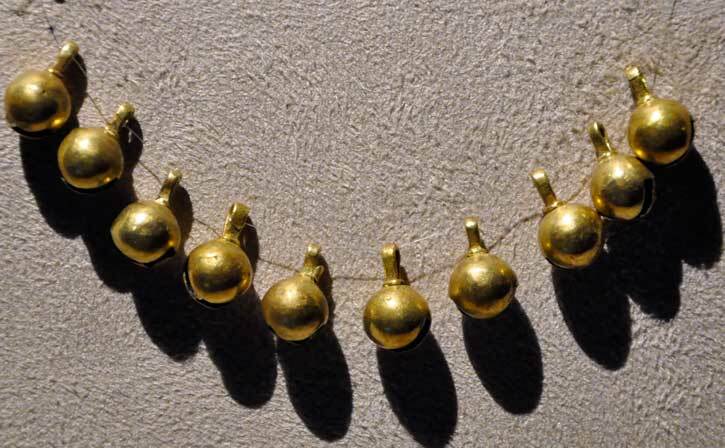 They were copper bells that were meant to imitate the sound of a rattlesnake’s tail. Dancers wearing them would move in rhythm with other instruments like drums, whistles and clay flutes. One of the most impressive Aztec ornaments is on display in the British Museum. 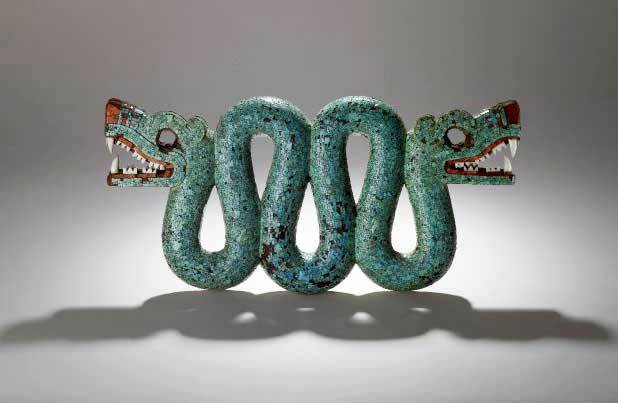 It’s a double-headed serpent pendant decorated with turquoise, shell and coral (pic 18). 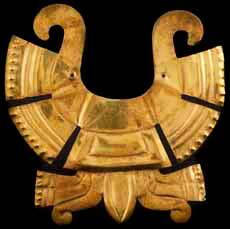 A pendant or pectoral would have hung down onto the chest and was probably worn by a priest during an important religious ceremony. 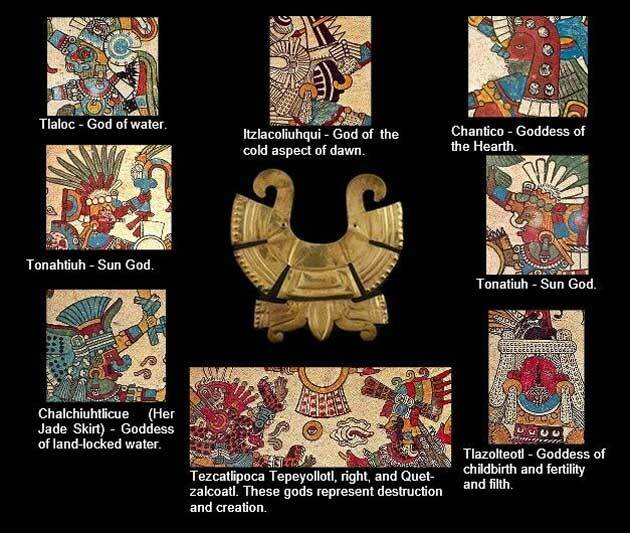 Of course, these are just some of the things that the Aztecs wore. 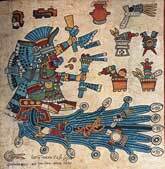 If you’re interested in other aspects of Aztec attire, why don’t you visit our pages on Aztec Clothing, Aztec Hairstyles, Aztec Headdresses (links below...)?